The World Cup is a gold trophy that is awarded to the winners of the FIFA World Cup for international soccer (globally known as football). Since the advent of the World Cup in 1930, two trophies have represented victory: the Jules Rimet Trophy from 1930 to 1970, and the FIFA World Cup Trophy from 1974 to the present day. The World Cup trophy, was originally named Victory. It was later renamed in honor of former FIFA president Jules Rimet. The Jules Rimet Trophy was made of gold plated sterling silver and lapis lazuli (a relatively rare, semi-precious stone that is prized for its intense blue color) and depicted Nike, the Greek goddess of victory. Brazil won the trophy outright in 1970, prompting the commissioning of a replacement. The Jules Rimet Trophy was stolen in 1983 (apparently melted down by the thieves) and never recovered. The replacement trophy, the FIFA World Cup Trophy, was first used in 1974. The World Cup is made of 18 carat gold with a malachite (a green-colored copper carbonate mineral) base. This green-colored base, it depicts two human figures holding up the Earth. The bottom side of the trophy bears the engraved year and name of each FIFA World Cup winner since 1974. The 18-karat-gold statue has been kept under lock and key at an undisclosed location since its predecessor, the Jule Rimet Trophy, was stashed under a bed during World War II, held ransom. 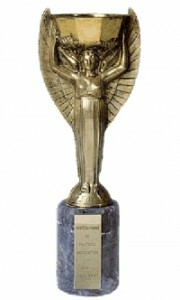 After 1970, a new trophy, known as the FIFA World Cup Trophy, was designed. The experts of FIFA, coming from seven different countries, evaluated the 53 presented models, finally opting for the work of the Italian designer Silvio Gazzaniga. The new trophy is 36 cm (14.2 in) high, made of solid 18-karat (75%) gold and weighs 6.175 kg (13.6 lb). This new trophy is not awarded to the winning nation permanently. World Cup winners retain the trophy until the next tournament and are awarded a gold-plated replica rather than the solid gold trophy. 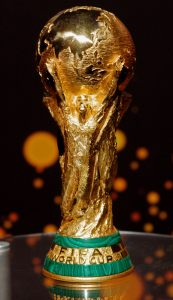 In trying to determine the value of the world cup it has been said that the trophy would probably be insured for its replacement value, rather than its value to a collector. The cost of the 18ct gold – roughly 75% pure – multiplied by the cost of gold at the time, and then add on the manufacture or sculpting costs, and you have a new World Cup. So, a new World Cup trophy would cost about £98,182 (approximately $12,000) plus design and labor. However the cost of the trophy is really immeasurable. You can get your own replica of The World cup Trophy here! This entry was posted in Uncategorized on July 16, 2010 by Spike's Trophies. When it comes to eminence and esteem, it doesn’t get any classier than the Wimbledon Championships for the sport of tennis…. Players from all over the world compete in the only grass court Grand Slam, for the rights to hold the silver gilt trophy and the sterling silver salver. Since it started in 1877, The Championships, Wimbledon, commonly referred to as simply Wimbledon, is the oldest major championship in the sport of tennis and is widely considered to be the most prestigious. The Ladies’ Singles champion receives a sterling silver salver commonly known as the “Venus Rosewater Dish”, or simply the “Rosewater Dish”. The salver, which is 18.75 inches (about 48 cm) in diameter, is decorated with figures from mythology. The original 50 guineas ( somewhere close to $150) trophy was made in 1864 by Messrs. Elkington and Co. Ltd of Birmingham and is a copy of an electrotype by Caspar Enderlein from the pewter original in the Louvre. There is a central design surrounded by four reserves, spread out to the rim. The remainder of the tray’s surface is decorated with gilt renaissance designs and foliate motifs in relief against a rigid silver ground. The theme of the decoration is mythological. The central figure of Temperance, seated on a chest with a lamp in her right hand and a jug in her left, with various attributes such as a sickle, fork and caduceus around her. The four reserves on the sides of the dish each contain a classical god, together with elements. The reserves around the rim show Minerva presiding over the seven Liberal Arts: Astrology, Geometry, Arithmetic, Music, Rhetoric, Dialectic and Grammar, each with relevant attribute. The rim of the tray has an oval molding, much like The Cup. And again, beginning in 1949 all champions has received a miniature replica of the trophy (diameter 8 inches) for their personal collection. The winners of the Gentlemen’s Doubles, Ladies’ Doubles, and Mixed Doubles events receive silver cups. The runner-up in each event receives an inscribed silver plate. The trophies are usually presented by the President of the All England Club, The Duke of Kent, and by his wife, the Duchess of Kent. At Wimbledon, more prize money was traditionally awarded in the Gentlemen’s events than in the Ladies’ events. However, as of 2007 prize money is equal at all levels (in part in response to a powerful protest by tennis player Venus Williams). This makes Wimbledon policy identical to that of the Australian Open, US Open, and most recently the French Open. Held annually between late June and the beginning of July for two weeks (usually ending, at the latest, on the second Sunday of July) at the All England Lawn Tennis and Croquet Club in London, England, the tournament is the third Grand Slam event played each year, preceded by the Australian Open and the French Open, and followed by the U.S. Open. The tournament duration is subject to extensions for rain. Separate tournaments are simultaneously held, all at the same venue, for Gentlemen’s Singles, Ladies’ Singles, Gentlemen’s Doubles, Ladies’ Doubles and Mixed Doubles. Youth tournaments – Boys’ Singles, Girls’ Singles, Boys’ Doubles and Girls’ Doubles – are also held. Additionally, special invitational tournaments are held: the 35 and over Gentlemen’s Doubles, 45 and over Gentlemen’s Doubles, 35 and over Ladies’ Doubles and wheelchair doubles. The Championships were first played under the control of the All England Lawn Tennis and Croquet Club in 1877 at a ground near Worple Road, Wimbledon; the only event held was Gentlemen’s Singles. In 1884, the All England Club added Ladies’ Singles and Gentlemen’s Doubles. Ladies’ Doubles and Mixed Doubles were added in 1913. The Championships moved to their present location, at a ground near Church Road, in 1922. 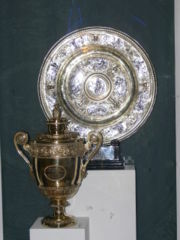 As with the other three Grand Slam events, Wimbledon was contested by top-ranked amateur players until the advent of the open era in tennis in 1968. Britons are very proud of the tournament but it is a source of national anguish and humour — no British man has won the singles event at Wimbledon since Fred Perry in 1936, and no British woman since Virginia Wade in 1977. The Championship was first televised in 1937. For the fans who do attend, it is customary to nosh on strawberries and cream. This entry was posted in Uncategorized on July 4, 2010 by admin.